You may be tempted to go all email for your fundraising, but don't! Direct mail (the printed stuff in your mailbox) is still healthy. Mail volume has been decreasing, but response rates are still at about 43 percent for commercial customers and even higher for prospective customers. Why? It seems that people trust printed marketing mail more than online mail. Plus, according to the USPS, people still like getting their mail. For fundraisers, printed mail is even more critical. The Direct Marketing Association reports that 70 percent of customers have restarted a relationship as a result of getting direct mail. That means that printed mail may be a great donor retention strategy. But are those materials designed for older readers? The sad truth is that designers, who are often young, may not think about the readability of their content for older eyes. Why should nonprofits care about older people? Baby Boomers are retiring and reaching peak giving years - 10,000 people turn 65 every day. They volunteer more. The median number of hours volunteered by people over 65 is 94 hours. They are living longer, enjoying a boom in longevity. As many Americans are over age 85 as are under five years old. A growing number of seniors will make it to their 100 year birthdays. 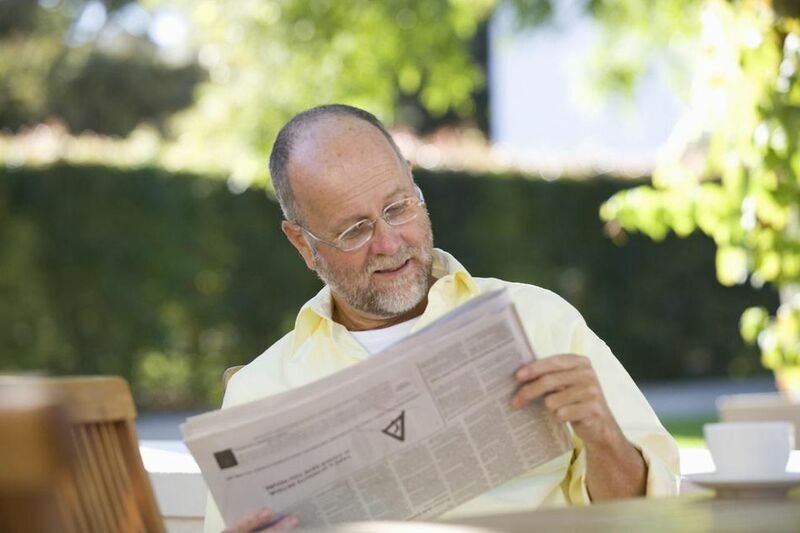 What else do we know about older adults? They are readers. They read magazines, newspapers, books, brochures, newsletters, direct mail fundraising appeals. They visit the public library frequently, and they may be the most loyal newspaper subscribers. Marketers, for-profit and nonprofit, continue to make grave errors in their print materials for mature audiences. Here are the top do's and don'ts of designing printed materials that appeal to your mature readers. Type size must be larger than average. Ask your designer to use 12 pt type and larger if you target an older demographic. Twelve-point type looks good and not like a large print version of Readers Digest - something that might turn off some people. A serif type is preferred for large blocks of printed text. A favorite serif typeface is "Times Roman," but there are many others. Never use only upper case letters LIKE THIS. Limit the use of italics, script and ornate typefaces. Use sufficient kerning (the white space around each character) between characters so that the letters don't seem to run together. Make line spacing larger than usual. Single space may be too hard to read so try 1.5 or double spacing. Use dark type on a light background. That provides the contrast that older eyes need to see well. You can never go wrong with black type on a white background, so use it most of the time. Use reverse type (light type on a dark background) only for headlines, never for large blocks of type. When choosing a "white" for your printed piece, pick a bright white, not an off-white. The more distinct the white and the blacker the type, the easier it will be for older eyes to read. Although it may seem counter-intuitive, the popularity of new electronic devices such as Kindles or iPads with mature people may have something to do with the fact that one can adjust both the brightness and the size of the type. Write short paragraphs and use subheadings, in bold, to break up the long copy. Paragraph after paragraph of text without subheadings looks gray and dreary and is hard on the eyes. Also, subheads make it easy for readers to scan and only read what is relevant to them. Make generous use of bullets, numbered lists, sidebars, and pull-out quotes to help break up your pages. Line length should be short--about five or six inches. Use columns when necessary. When using color for headings or backgrounds, choose carefully. The older eye develops a yellow cast, and it becomes harder to distinguish between certain colors. For instance, blue, purple and green may look alike when used together. Yellow, orange, and red are much easier to tell apart. Never put type over a photo, not even your headlines. Here is an easy test for readability: photocopy the page. If the photocopy is easy to read, then you can be sure the original is readable. Type printed on images will not be readable when photocopied. Use photos that are sharp and crisp. Using something fuzzy for artistic effect will have older readers trying to clean their glasses. Favor photos of people especially their faces. A person's face looking directly at the reader is a powerful force. Black and white images work fine and can be very useful. Avoid coloring a black and white photo or using any additional photographic effects. Sepia, for instance, might be artistic, but it makes a photograph harder to see for older people. Light reflects from the gloss and makes it very difficult for the reader to see the print. Use a matte finish. Don't laminate materials or put them into plastic sleeves. This is a favorite ploy for salespeople and restaurant menus but will have older readers tilting the plastic-encased material to see past the glare. Avoid complex folding of your printed piece. Conquering a complicated folded piece (just think of old road maps) becomes harder as we age. For brochures, use a simple double or tri-fold. Avoid jumps for newsletters, where an article continues on another page. People should be able to read an article through without having to look for the end. Keep those items shorter too. Did We Say They Like to Read? Don't take print for granted. Work with your designer to make sure that your mature readers can quickly understand your information. With care, your material can be both stylish and comfortable to read. Mature adults are enthusiastic readers. Take advantage of it.